deme specializes in dental implants, a lasting way to replace missing teeth, as a solution for bite problems caused by teeth shifting into missing tooth space, as well as supporting a bridge or denture, making them more secure and comfortable. Dental implants are very strong, stable, and durable and will last many years, but on occasion, they will have to be re-tightened or replaced due to normal wear. 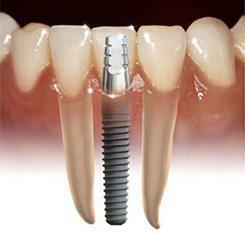 Dental implants are artificial roots and teeth that are surgically placed into the upper or lower jaw bone. The teeth attached to implants are very natural looking and often enhance or restore a patient’s smile. deme dentist Boris Babiner specializes in periodontoplastic and dental implant procedures, as well as complex full mouth rehabilitation. Dr. Babiner provides a thorough exam and recommendations for the best approach. The process of getting implants requires a number of visits over several months. X-rays and impressions are first taken of the jaw and teeth to determine bone, gum tissue, and spacing available for an implant. After the titanium-based root implant is created, it is surgically placed into the bone and allowed to heal and integrate itself onto the bone for up to six months. Depending on the type of implant, a second surgery may be required in order to place the “post” that will hold the artificial tooth in place. After several weeks of healing, the artificial tooth (or teeth) is constructed and fitted to the post portion of the anchor. Several fittings may be required, so this step may take one to two months to complete. After a healing period, the artificial teeth are securely attached to the implant, providing excellent stability and comfort to the patient. Contact demė - dental care in Philadelphia, PA to schedule your dental implant consultation appointment today. We are happy to help our patients who come to us from Philadelphia and the suburbs, Delaware, South Jersey, Wilmington, King of Prussia, Doylestown, Cherry Hill, Bucks County, Lehigh Valley, Allentown, Bethlehem, West Chester, Main Line, Montgomery County.